Hey there, and thanks for stopping by. Today we’re taking a look at the lineup of rangefinders produced by Leica, a high-performance sporting optics manufacturer. This company provides you, the hunter, with a rangefinder that will meet almost any need and preference, whether you prefer the gorgeous viewing of a binocular-based rangefinder or the convenience of a handheld monocular variant. Let’s see how the firm’s rangefinders perform, as well as what sort of features you can expect from the catalog. Can I Find A Good Leica Rangefinder On A Short Budget? This depends on what you mean by “a short budget.” Leica is a premier manufacturer, and its prices generally reflect that fact. With that said, you can usually find a decent model for a price that won’t completely break your bank. 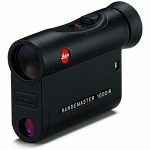 The CRF 1000-R 7x24mm Laser Rangemaster, for example, is billed as an ideal starter model for archery and hunting. It provides excellent accuracy, fantastic clarity and image quality, and a range of up to 1,000 yards. The primary drawbacks of this model are the use of a CR–2 battery for power and the limited accuracy beyond 500 yards – this variant is only accurate to ± two yards at the upper limits of its range. What’s The “Best Of The Best” Model? Perhaps the most versatile laser rangefinder Leica offers is the Geovid HD-B 42 Edition 2200. Unlike most of the rangefinders I’ve used, this model incorporates the idea of rangefinding binoculars, integrating a high-performance multifunction ballistic computer into the design to provide elevation compensation based on practically all standard loads of ammunition. On top of that, the binocs allow users to upload their own specific parameters for hand-loaded or special ammunition from a microSD card. Ballistic information is provided after taking into account the ammunition specifics, angle, temperature, and barometric pressure. The only real downside to the Geovid HD-B 42 is the nearly astronomical price tag. What Do Leica’s Rangefinders Have In Common? Almost every laser rangefinder Leica produces is powered by a single CR–2 battery, to my constant dismay. This is a problem shared by almost every rangefinder, no matter the manufacturer, and only bothers me because these batteries can be difficult to locate in the rural areas we hunters tend to frequent. On the other hand, almost every Leica rangefinder produced integrates an inclinometer to provide you with equivalent horizontal distance to your target based on your prey’s elevation compared to yours. 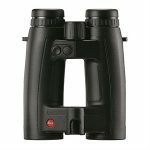 Leica stands out from most of the competition by being one of the few manufacturers to produce porro-prism based rangefinding binoculars. These highly functional and ergonomic models make finding your target much easier than a monocular-based laser rangefinder, since they often feature stronger magnification along with a wider field of view. Are Its Models Simple To Operate? Since the Geovid and Rangemaster series often integrate many features, Leica tends to gravitate towards the use of two buttons for operation. This breaks out the power function from the various modes, greatly simplifying use of the accessory. This design also allows for incorporating more features into the rangefinder without making them “always on” and cluttering your view. You can quickly and easily turn off the functionalities you don’t wish to use, streamlining your display to only show the information you plan on making use of. How Feature-Rich Are Leica’s Laser Rangefinders? Leica’s rangefinders are typically very flush with useful features. They provide autofocus that works superbly, and feature equivalent horizontal distance modes to help you compensate for the angle of your shot. Remember, for ballistics purposes, the range to a deer downhill from you will be shorter than if the deer was on level ground. Conversely, the distance to that same animal will be effectively longer if the creature is uphill from you. To help you bring your prey closer to you and range it amidst brush and other obstacles, Leica utilizes 7X magnification on most models and offers Scan and Brush modes to help you weed out your target from amidst various other objects. To provide an even more accurate ballistic compensation, Leica rangefinders incorporate sensors that take the weather into account before giving you the range to your target. An integrated barometric and temperature sensor provides the data, which is used to provide the user with the most accurate equivalent horizontal range possible. How Well Do The Rangefinders Handle Eye Relief? Eye relief is generally good in these products, giving you plenty of room between the eyepiece and your spectacles while still allowing you a full sight picture. In cases where you really want to use the laser rangefinder without your eyeglasses, all Leica models offer diopter adjusters to compensate for your vision impairment. Can Leica’s Products Be Used In Low-Light Conditions? Thanks to generous objective lenses and the application of fully multicoated optics, light transmission is quite good on these products. The transmittance rivals and, in some cases, even exceeds all of the competition. To make a long story short, you will be able to see your target in even the dimmest hours of twilight. The only drawback you’ll find is in reading the display – Leica is still using black LCD readouts, which are difficult to discern in low-light conditions. How Good Are The Optics On These Accessories? As previously detailed, the optics on Leica’s laser rangefinders are among the best in the industry. Image clarity, contrast, and crispness are all outstanding. The only thing that would make the sight picture even better would be the use of Extra Low Dispersion glass, which is overkill for a rangefinder. Will My Leica Rangefinder Focus Well? The autofocus mechanism in these models is best-in-class, providing you with a sharp, clean image quickly and easily. In a record-breaking 0.3 seconds, a Leica rangefinder will give you a sharp image, determine all of the most important parameters for your shot, and provide you with the range to your target. You’ll also enjoy a generous field of view of 384 feet from 1,000 yards. How Long-Lasting Are Leica’s Products? Leica builds its rangefinders to last, but it doesn’t stand behind its products as strongly as some of the competition. The warranty period for a Leica rangefinder is typically only two years, compared to the lifetime warranty offered by Bushnell and Leupold. Thanks for reading my take on Leica’s lineup of laser rangefinders. These are great products, but they are quite expensive and aren’t backed by a warranty that reflects the amount of investment you are making. If your budget is sizable and you are careful with your equipment, though, the feature-rich Leica rangefinders are almost without parallel. Hi there! I’m Jeff, an avid outdoorsman and hunter who really likes exploring new technology. I’m especially into hunting optics, which is why I’m writing these reviews! I hope you find my articles helpful in your own shooting and hunting.